Download "A Fresh Look at. Traditional and Nontraditional. Undergraduates at KSU"
2 DEFINITION OF THE TRADITIONAL UNDERGRADUATE STUDENT The commonly held definition of a traditional undergraduate student is one who enrolls in college immediately after graduation from high school, pursues college studies on a continuous full-time basis at least during the fall and spring semesters, and completes a bachelor s degree program in four or five years at the young age of 22 or 23. Traditional students are also typically financially dependant on others, do not have children, consider their college career to be their primary responsibility, and are employed only on a parttime basis if at all during the academic year. 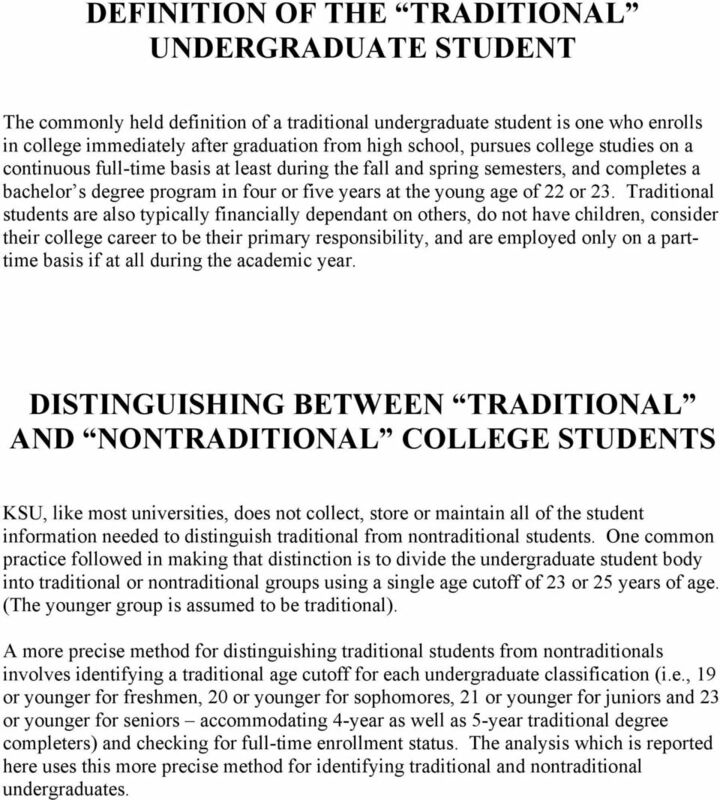 DISTINGUISHING BETWEEN TRADITIONAL AND NONTRADITIONAL COLLEGE STUDENTS KSU, like most universities, does not collect, store or maintain all of the student information needed to distinguish traditional from nontraditional students. One common practice followed in making that distinction is to divide the undergraduate student body into traditional or nontraditional groups using a single age cutoff of 23 or 25 years of age. (The younger group is assumed to be traditional). 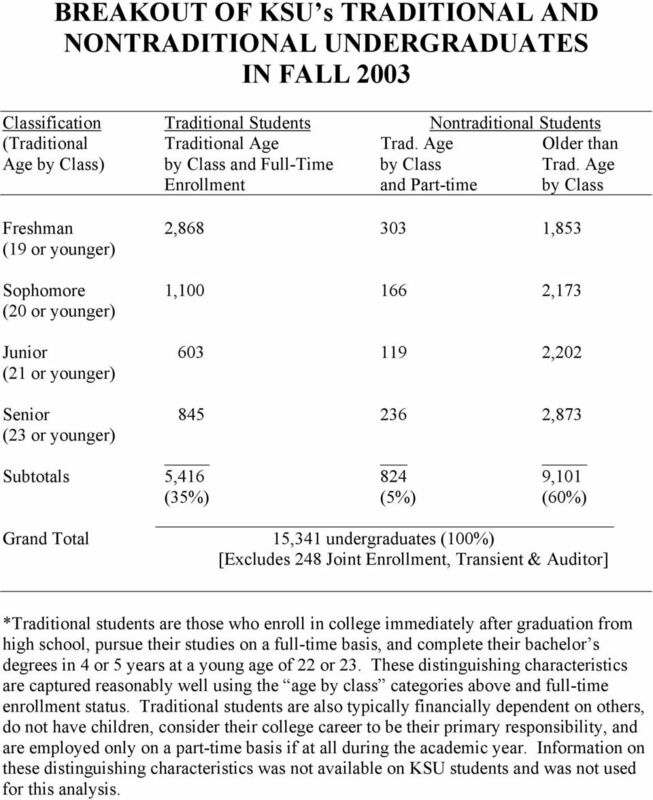 A more precise method for distinguishing traditional students from nontraditionals involves identifying a traditional age cutoff for each undergraduate classification (i.e., 19 or younger for freshmen, 20 or younger for sophomores, 21 or younger for juniors and 23 or younger for seniors accommodating 4-year as well as 5-year traditional degree completers) and checking for full-time enrollment status. The analysis which is reported here uses this more precise method for identifying traditional and nontraditional undergraduates. 3 HIGHLIGHTS OF KSU s NONTRADITIONAL STUDENT BODY IN FALL 2003 The common practice of using a single age cutoff such as 23 or 25 to distinguish between traditional and nontraditional undergraduates without regard to full-time or part-time enrollment status or the traditional ages associated with each of the four undergraduate classifications can result in inflated estimates of traditional student enrollment. For example, over half (53%) of KSU s undergraduates were under 23 years of age in Fall 2003 and could have been characterized as traditional by that definition which uses a single age cutoff. However, such a conclusion would have been inflated and misleading as the following highlights indicate. 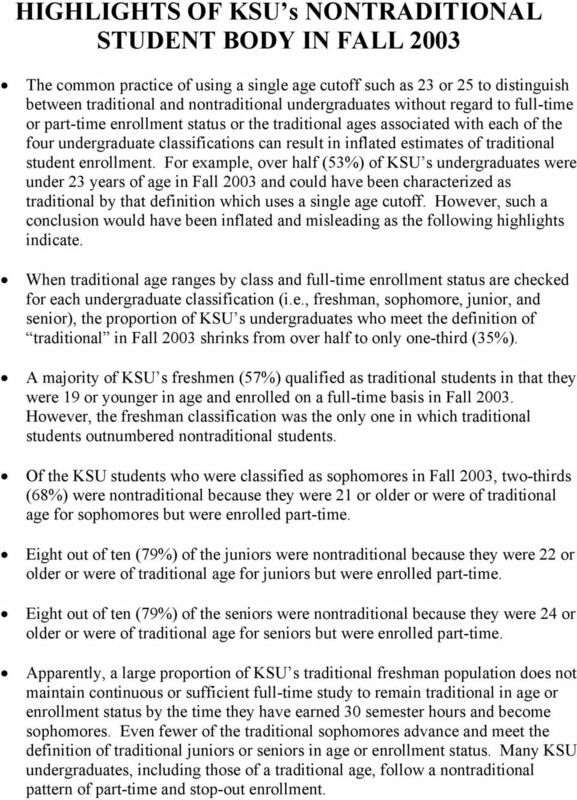 When traditional age ranges by class and full-time enrollment status are checked for each undergraduate classification (i.e., freshman, sophomore, junior, and senior), the proportion of KSU s undergraduates who meet the definition of traditional in Fall 2003 shrinks from over half to only one-third (35%). A majority of KSU s freshmen (57%) qualified as traditional students in that they were 19 or younger in age and enrolled on a full-time basis in Fall However, the freshman classification was the only one in which traditional students outnumbered nontraditional students. Of the KSU students who were classified as sophomores in Fall 2003, two-thirds (68%) were nontraditional because they were 21 or older or were of traditional age for sophomores but were enrolled part-time. Eight out of ten (79%) of the juniors were nontraditional because they were 22 or older or were of traditional age for juniors but were enrolled part-time. Eight out of ten (79%) of the seniors were nontraditional because they were 24 or older or were of traditional age for seniors but were enrolled part-time. Apparently, a large proportion of KSU s traditional freshman population does not maintain continuous or sufficient full-time study to remain traditional in age or enrollment status by the time they have earned 30 semester hours and become sophomores. Even fewer of the traditional sophomores advance and meet the definition of traditional juniors or seniors in age or enrollment status. Many KSU undergraduates, including those of a traditional age, follow a nontraditional pattern of part-time and stop-out enrollment. 4 HIGHLIGHTS CONTINUED Beyond the freshman classification, three-fourths of KSU s sophomores, juniors and seniors were nontraditional and only one-fourth were traditional in age and full-time enrollment status. 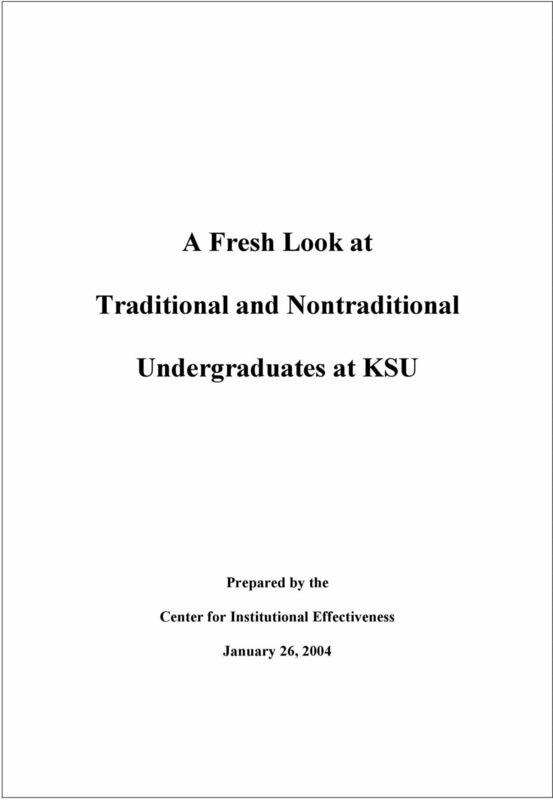 The large and fast growing number of KSU freshmen who are traditional (or who initially appear to be traditional in their first semester at KSU) has led to a commonly held observation that KSU s undergraduate student body appears to be increasingly less nontraditional and more traditional. 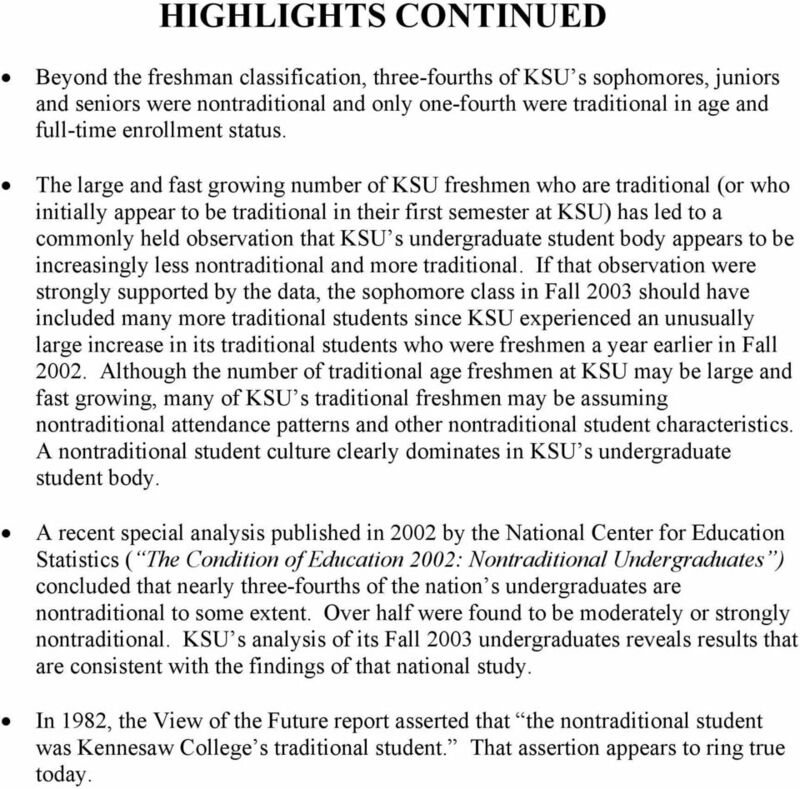 If that observation were strongly supported by the data, the sophomore class in Fall 2003 should have included many more traditional students since KSU experienced an unusually large increase in its traditional students who were freshmen a year earlier in Fall Although the number of traditional age freshmen at KSU may be large and fast growing, many of KSU s traditional freshmen may be assuming nontraditional attendance patterns and other nontraditional student characteristics. A nontraditional student culture clearly dominates in KSU s undergraduate student body. A recent special analysis published in 2002 by the National Center for Education Statistics ( The Condition of Education 2002: Nontraditional Undergraduates ) concluded that nearly three-fourths of the nation s undergraduates are nontraditional to some extent. Over half were found to be moderately or strongly nontraditional. KSU s analysis of its Fall 2003 undergraduates reveals results that are consistent with the findings of that national study. In 1982, the View of the Future report asserted that the nontraditional student was Kennesaw College s traditional student. That assertion appears to ring true today. 5 BREAKOUT OF KSU s TRADITIONAL AND NONTRADITIONAL UNDERGRADUATES IN FALL 2003 Classification Traditional Students Nontraditional Students (Traditional Traditional Age Trad. Age Older than Age by Class) by Class and Full-Time by Class Trad. Age Enrollment and Part-time by Class Freshman 2, ,853 (19 or younger) Sophomore 1, ,173 (20 or younger) Junior ,202 (21 or younger) Senior ,873 (23 or younger) Subtotals 5, ,101 (35%) (5%) (60%) Grand Total 15,341 undergraduates (100%) [Excludes 248 Joint Enrollment, Transient & Auditor] *Traditional students are those who enroll in college immediately after graduation from high school, pursue their studies on a full-time basis, and complete their bachelor s degrees in 4 or 5 years at a young age of 22 or 23. These distinguishing characteristics are captured reasonably well using the age by class categories above and full-time enrollment status. Traditional students are also typically financially dependent on others, do not have children, consider their college career to be their primary responsibility, and are employed only on a part-time basis if at all during the academic year. Information on these distinguishing characteristics was not available on KSU students and was not used for this analysis. COLORADO 2011 For a strong economy, the skills gap must be closed. KENTUCKY 2011 For a strong economy, the skills gap must be closed. Recruiting Teachers Using Student Financial Aid: Do Scholarship Repayment Programs Work? OFFICE OF RESOURCE MANAGEMENT & PLANNING REVISED ISSUE REPORT Undergraduate Time to Degree Completion Rates by College and Division ISSUES How does time-to-degree differ among the six undergraduate colleges/divisions? NEW MEXICO 2011 For a strong economy, the skills gap must be closed. Purpose of Program The Starbucks College Achievement Plan ( CAP or the Program ), has been developed for Starbucks partners to provide them with an opportunity for high quality undergraduate education. MASSACHUSETTS 2011 For a strong economy, the skills gap must be closed. Prerequisite a course must be taken before a target course, i.e., successful completion of EH 101 before registering for EH 102.